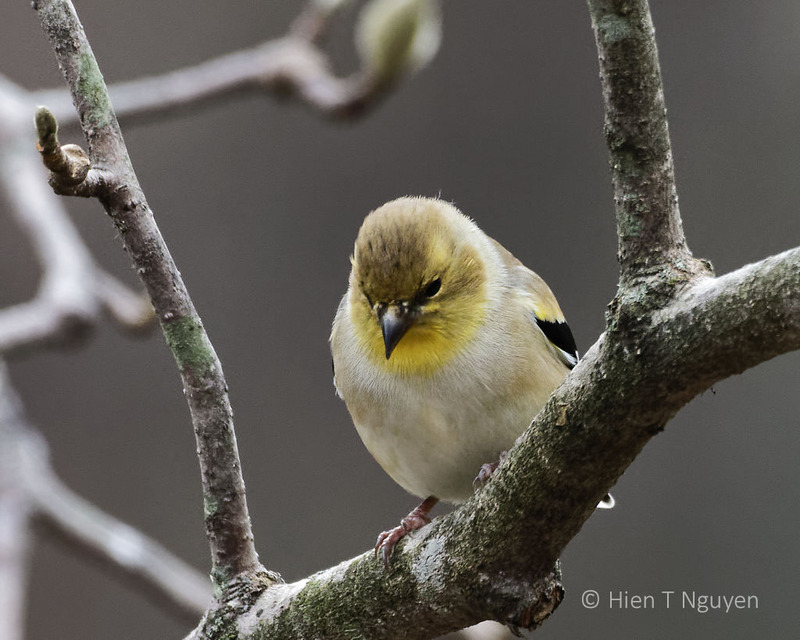 The American Goldfinch stands out with its bright yellow coloring in Spring and Summer. 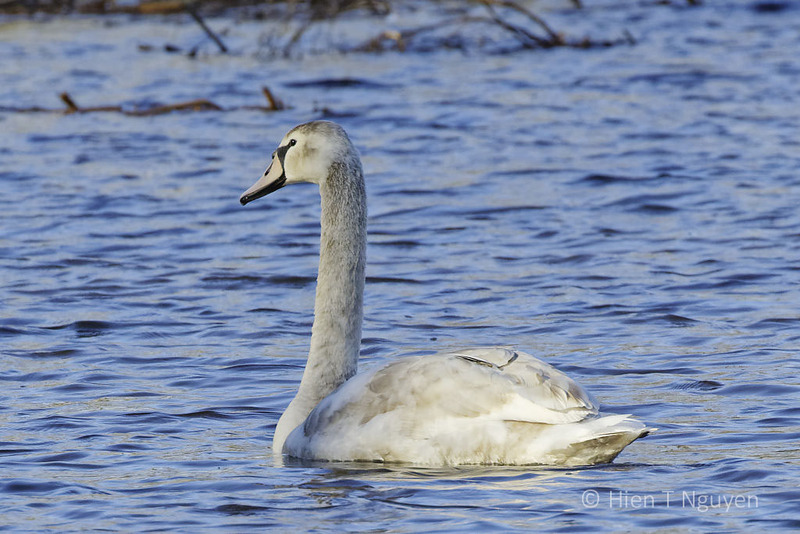 The rest of the year, when they are not breeding, their colors are more subdued, even drab, although they still remain very cute. 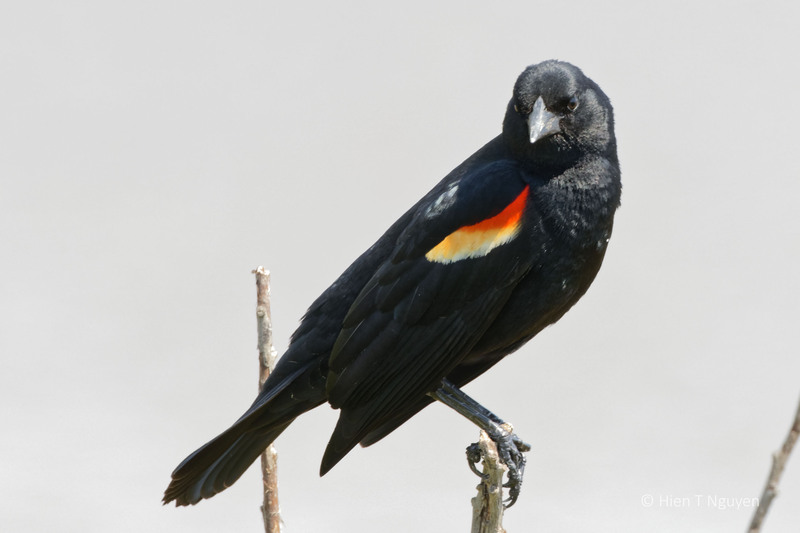 Another ubiquitous bird is the Red-winged Blackbird. 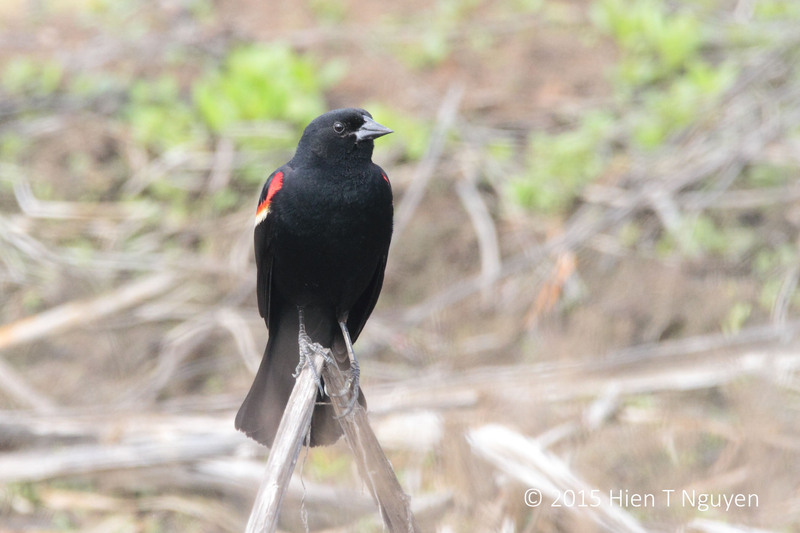 Red-winged Blackbird at Edwin B Forsythe NWR.. 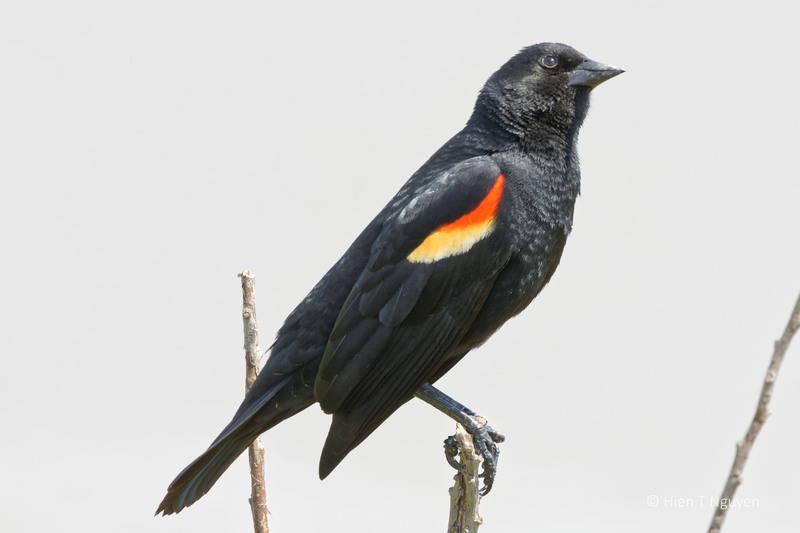 The female Red-winged Blackbird does not have that red and yellow patch on her wings. 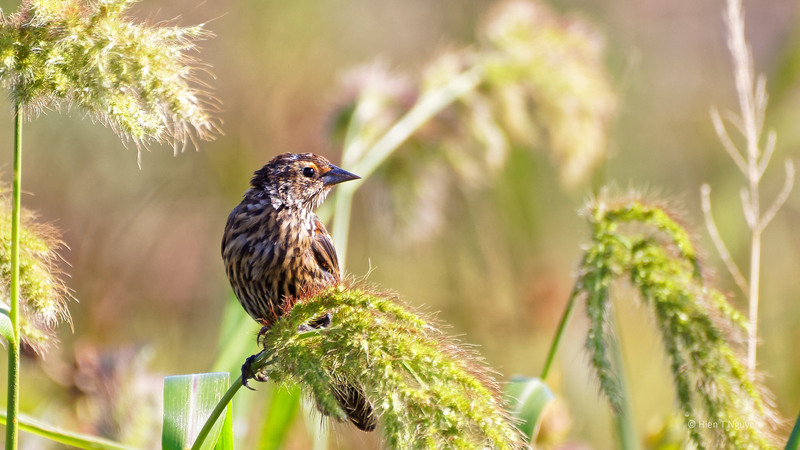 Female Red-winged Blackbird at Edwin B Forsythe NWR.. 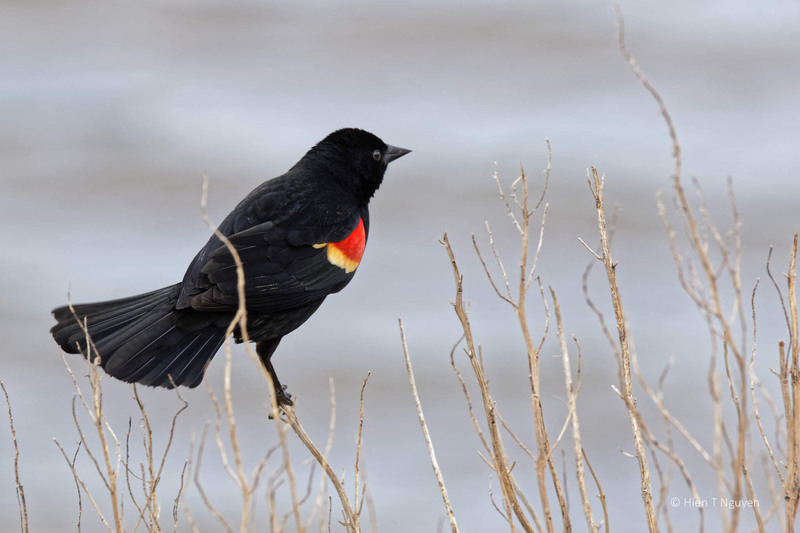 In the fall, Red-winged Blackbirds often join with European Starlings to form flocks of birds that roam through refuges, importuning even Bald Eagles. 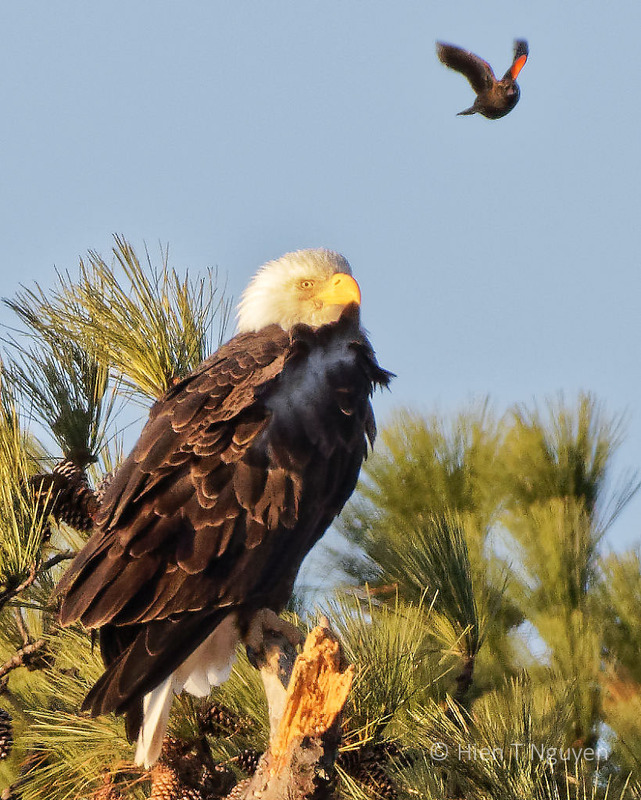 Bald Eagle at Blackwater NWR being buzzed by Red-winged Blackbird. 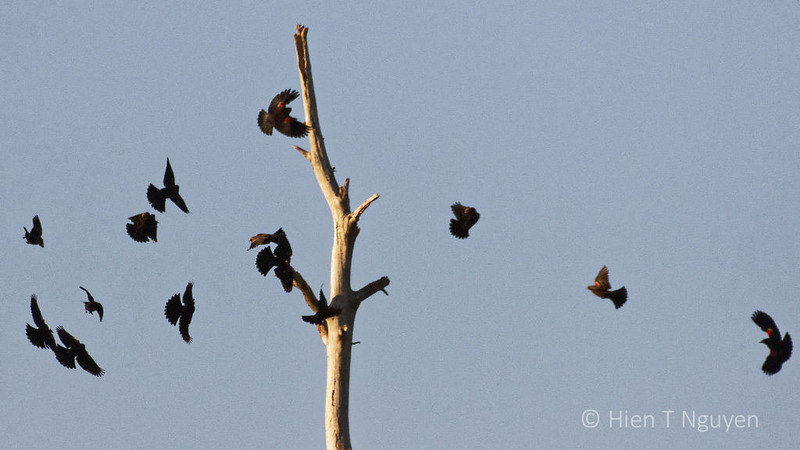 The smaller birds temporarily took over a favorite perch of the Bald Eagles at Blackwater NWR. 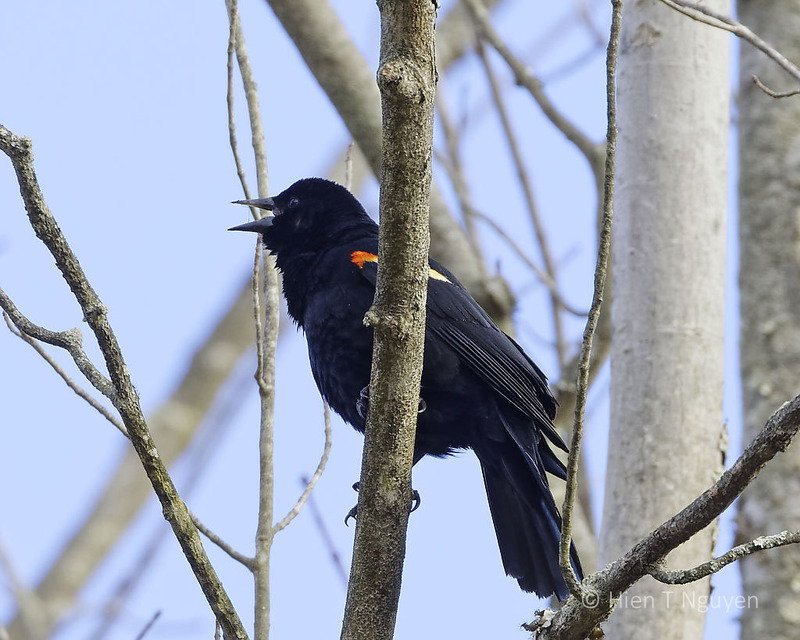 Red -winged Blackbirds swarming a Bald Eagle favorite tree. 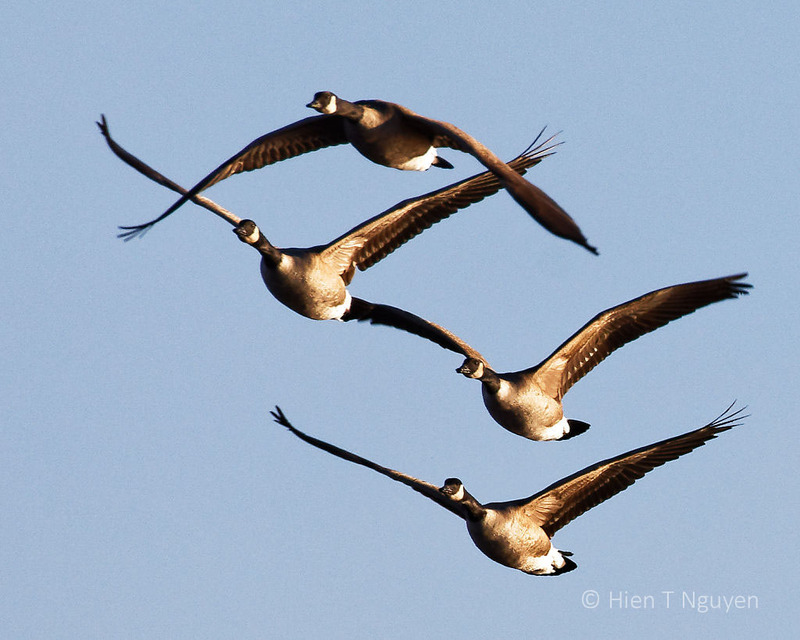 Finallly, many flocks of Canada Geese flew over the non-migrating Bald Eagle. 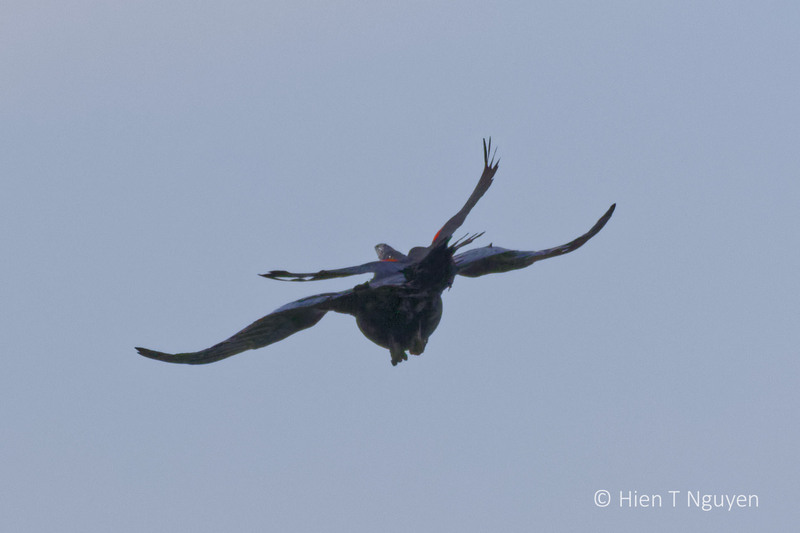 Canada Geese flying over Bald Eagle at Blackwater NWR. 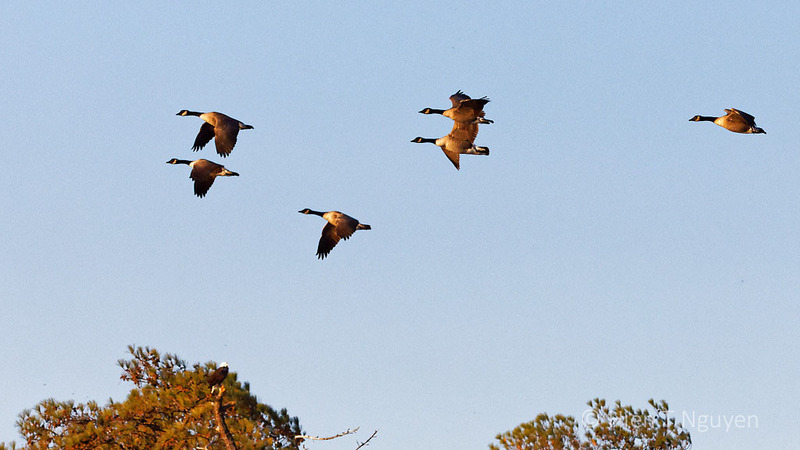 Canada Geese at Blackwater NWR. 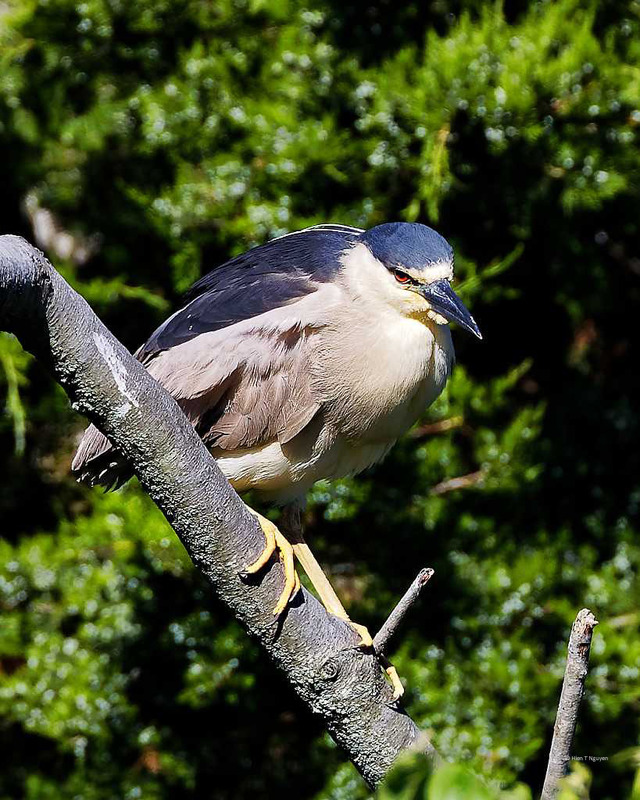 Black-crowned Night Herons are a major presence at the rookery next to the Welcome Center at Ocean City, NJ. 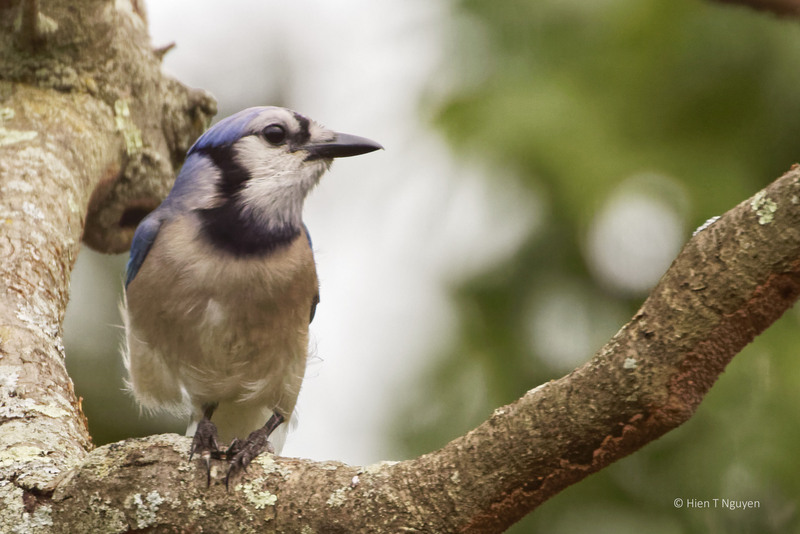 These birds hunt for their food starting at dusk, and their eyes are one of their most noticeable features. 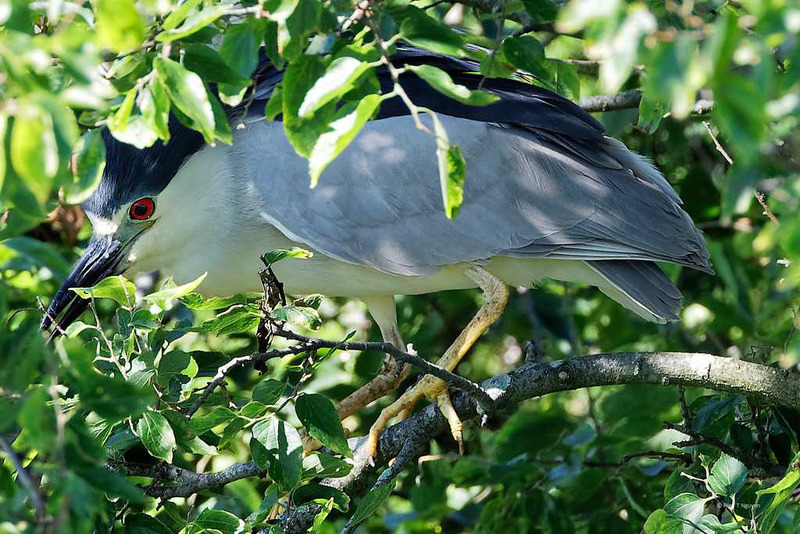 Despite their size these Herons are easily intimidated by the Red-winged Blackbird, a fierce defender of its territory. 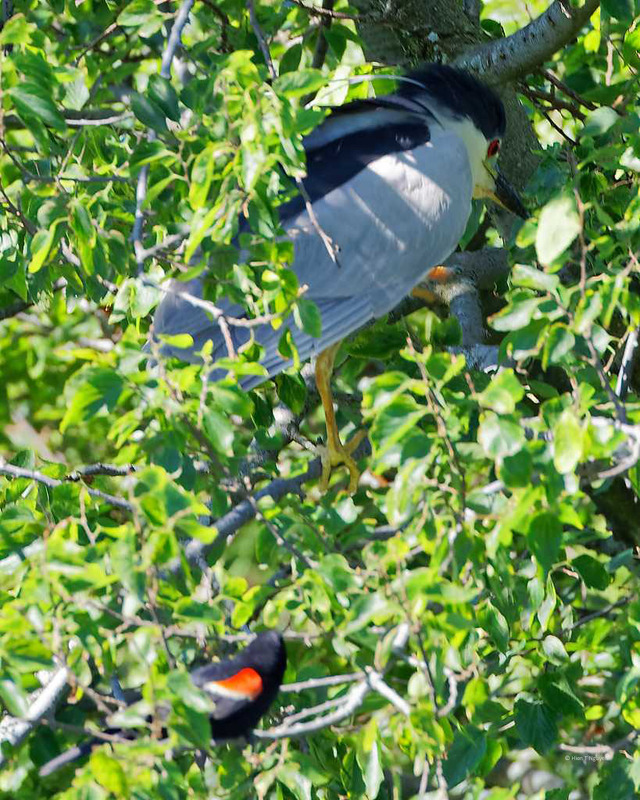 I saw a Blackbird chase a Heron into a tree. 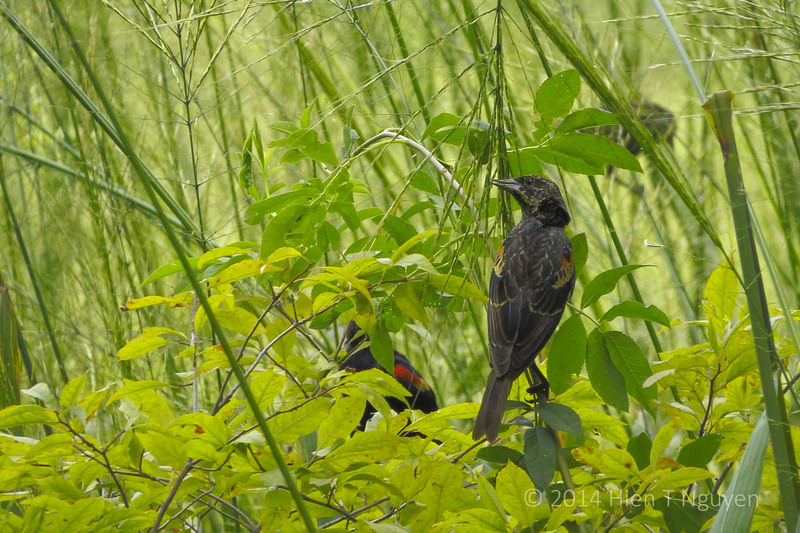 Red-winged Blackbird and Black-crowned Night Heron. 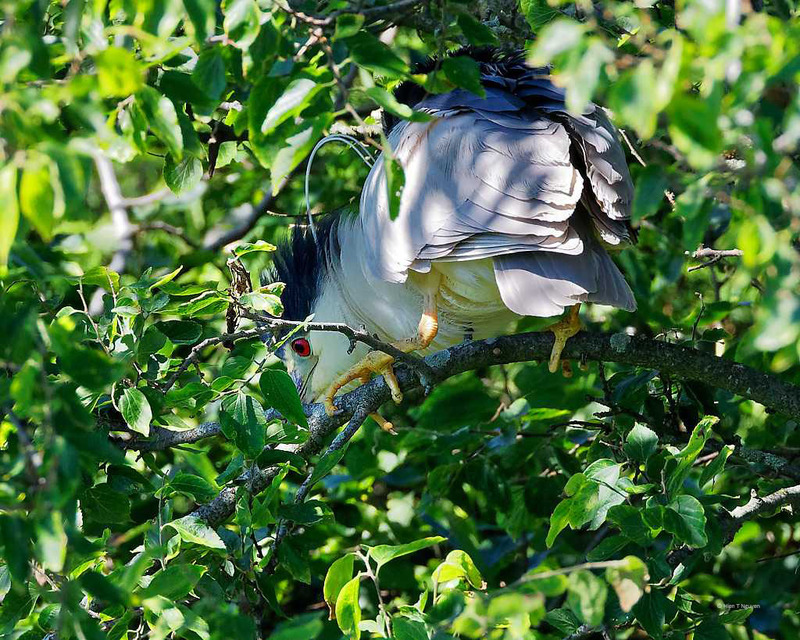 Pursued by the Blackbird, the Heron tried to hide among the branches. 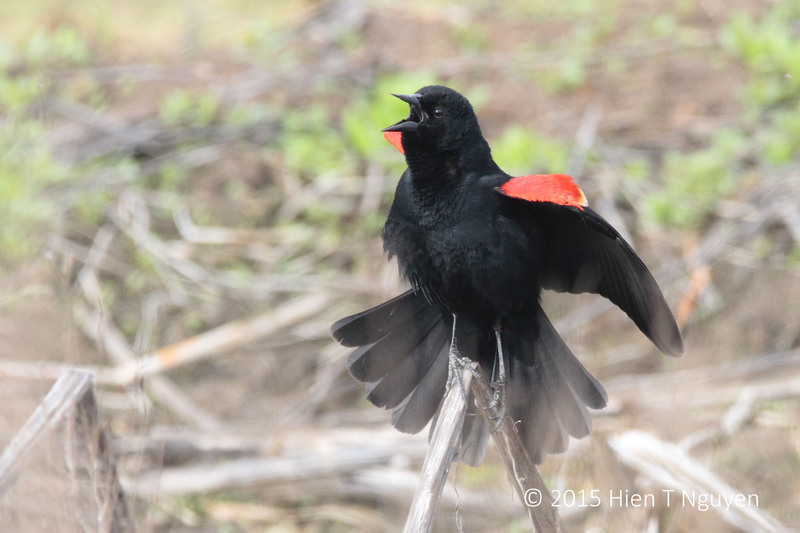 Unfortunately, too many leaves shielded the small Blackbird from the camera. 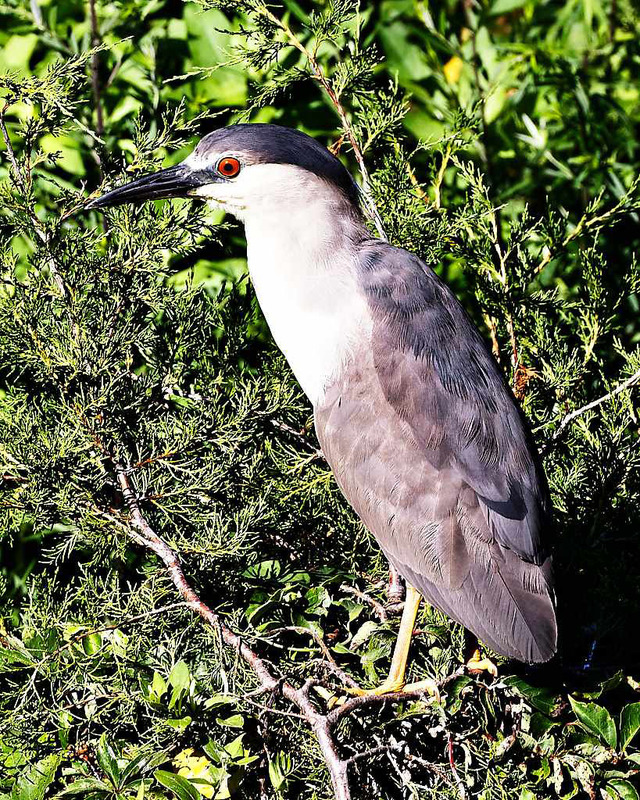 Black-crowned Night Heron very wary of Red-winged Blackbird. 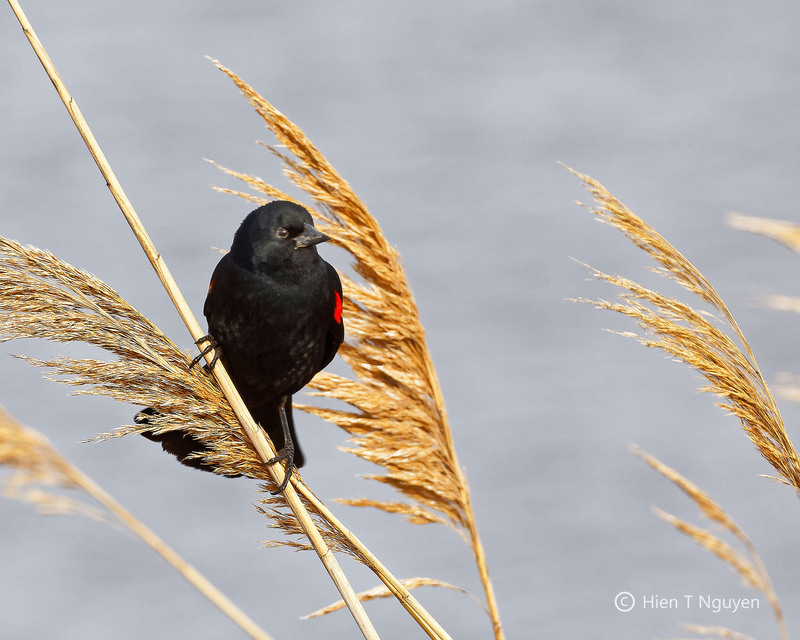 Red-winged Blackbirds are everywhere at the refuge, with the male birds sporting red and yellow shoulder badges. 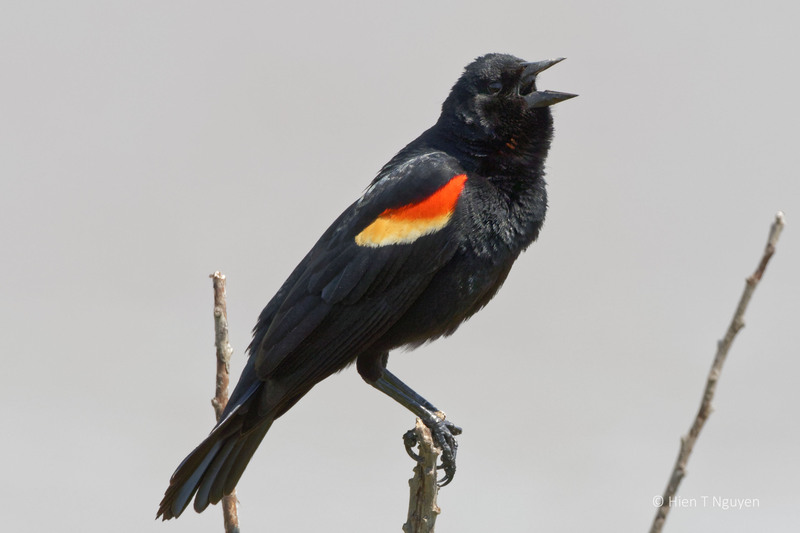 This time of the year the males fly to find high perches from which they belt out their incessant songs. 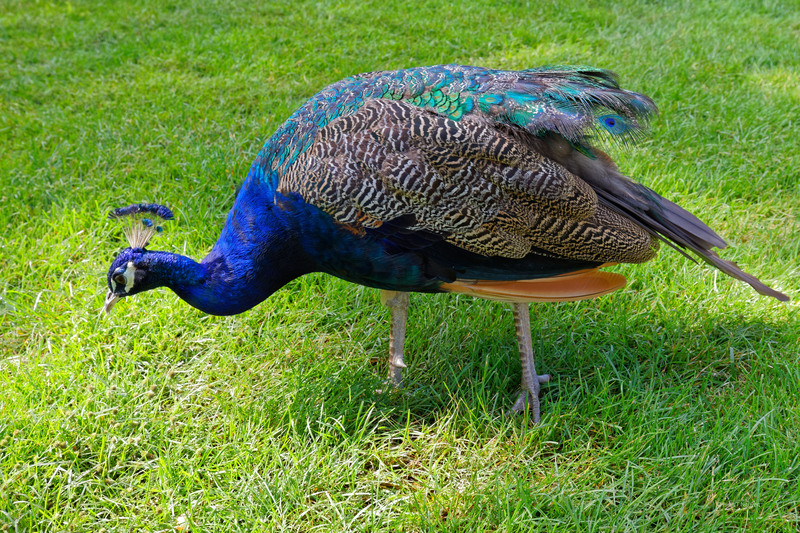 They show no fear of cars and humans, and are easy to photograh. 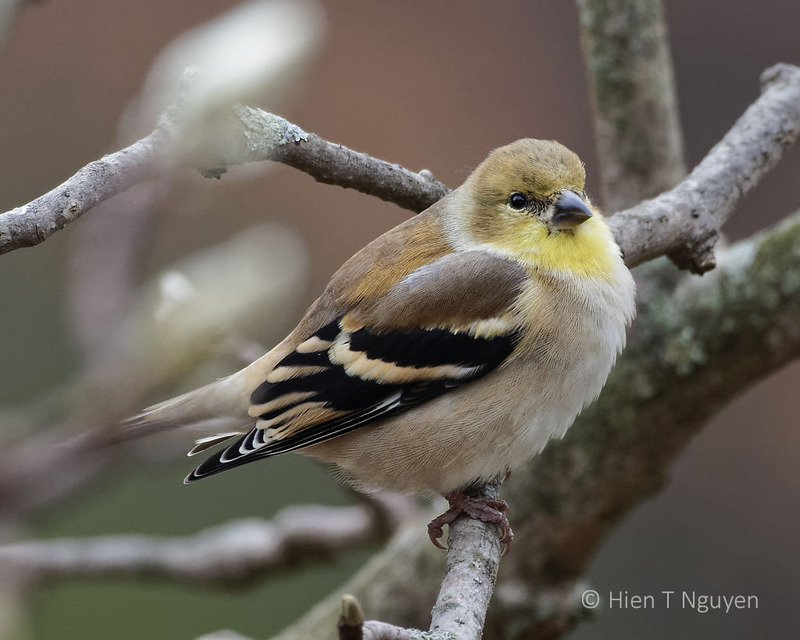 Going through some unpublished photos I took over the last few months, I am struck by the many different kinds of birds that live in our small part of New Jersey. 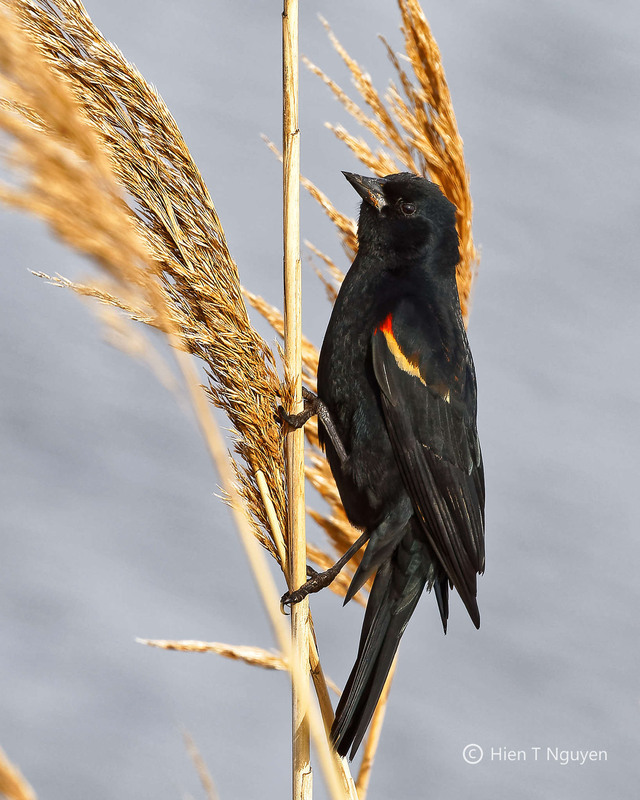 Here’s how diversity looks among birds. 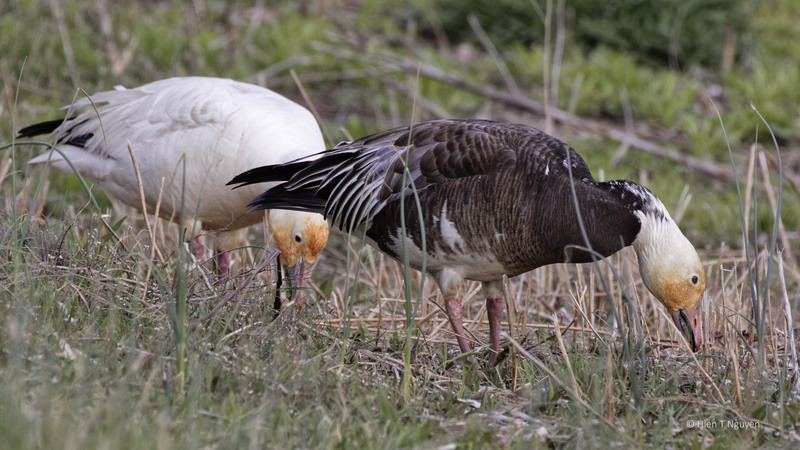 Snow Geese. 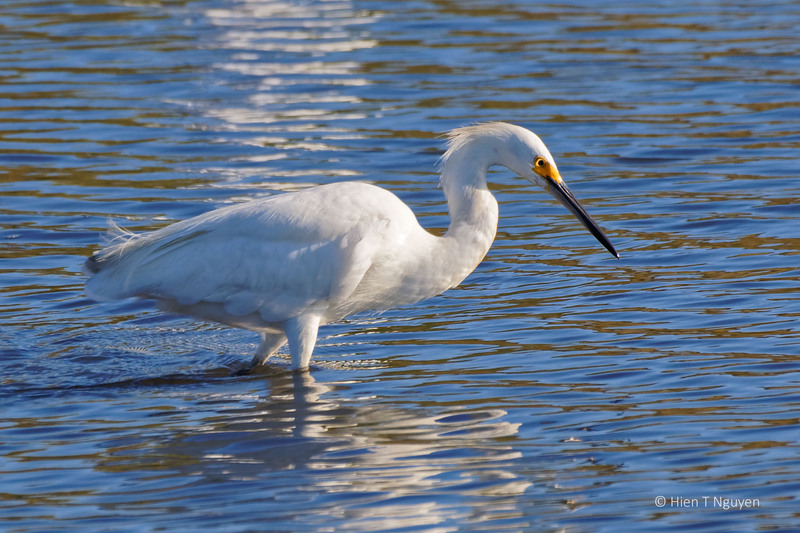 They are not all white. 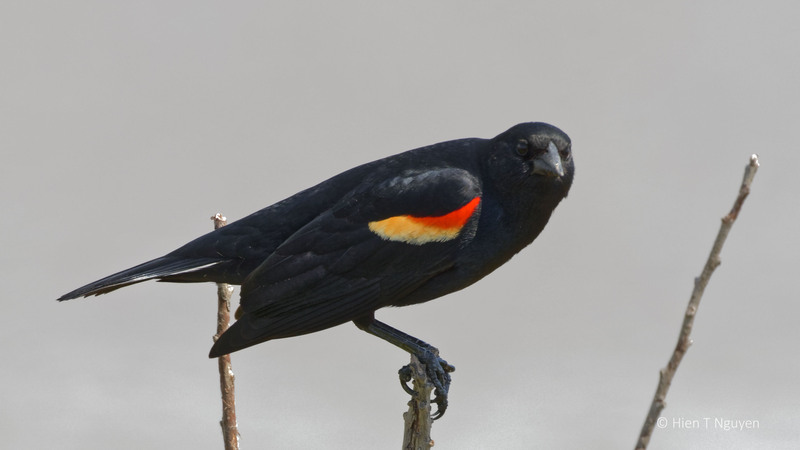 The male Red-winged Blackbird is easily recognized by his red and yellow shoulder patches and his propensity to sing for any reason from the top of reeds or bushes. 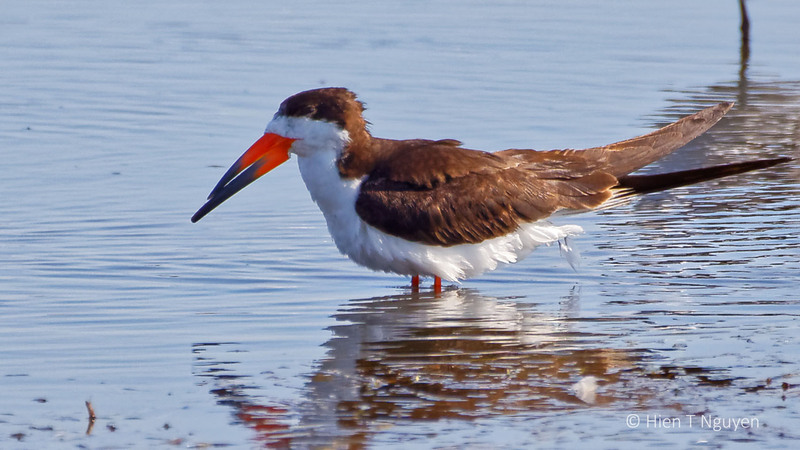 I saw the one pictured below at the Blackwater National Wildlife Refuge in Maryland more than a week ago. 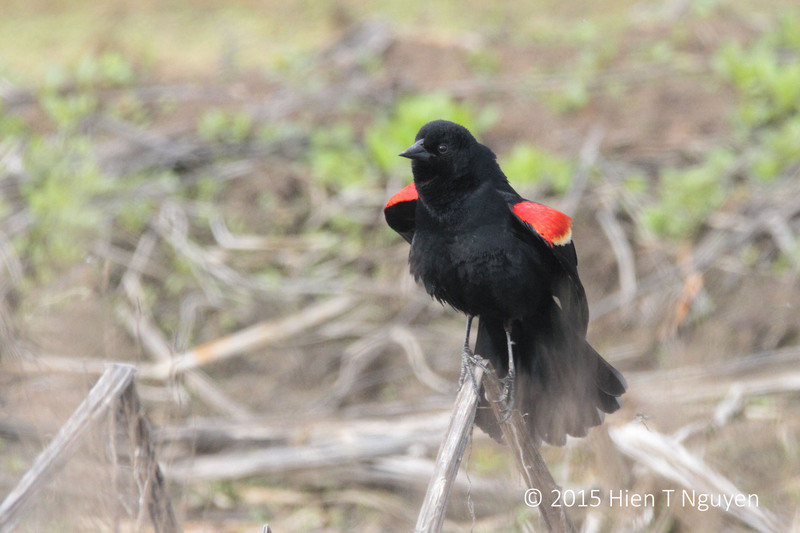 He was not shy, stood his ground, and continued serenading even as my car came nearer to him. 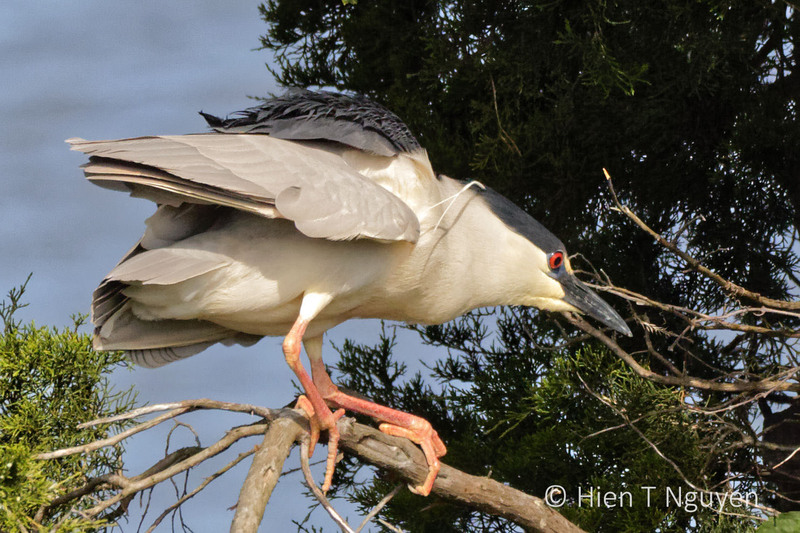 Going through my files from this past June, I found the following series showing a Red-winged Blackbird dive-bombing a Black-crowned Night Heron that had strayed too close to its nest. 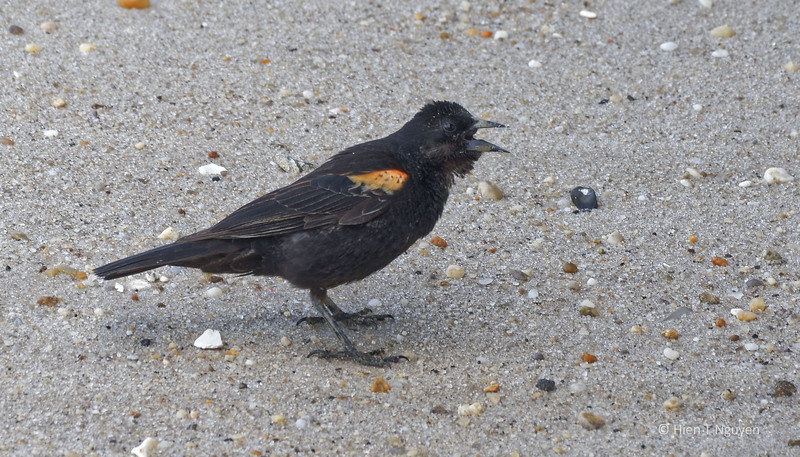 This all happened in less than a minute near the Ocean City Welcome Center in New Jersey. 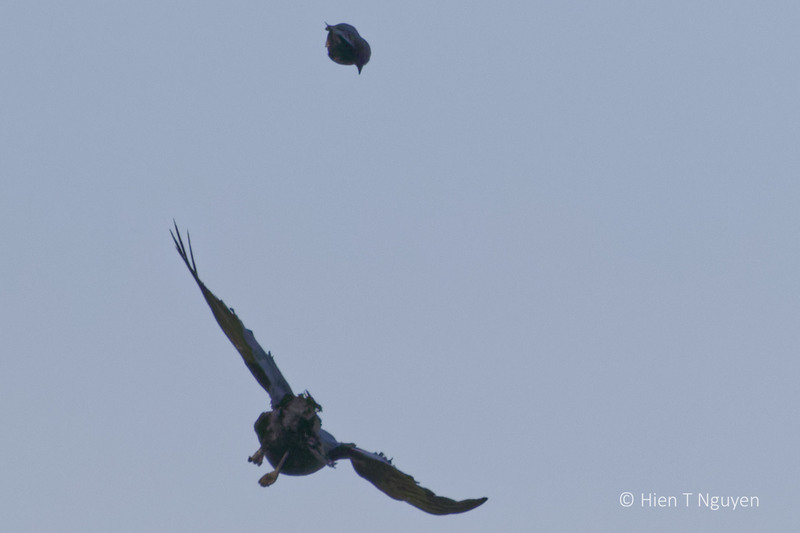 Red-winged Blackbird dive-bombing Black-crowned Night Heron. 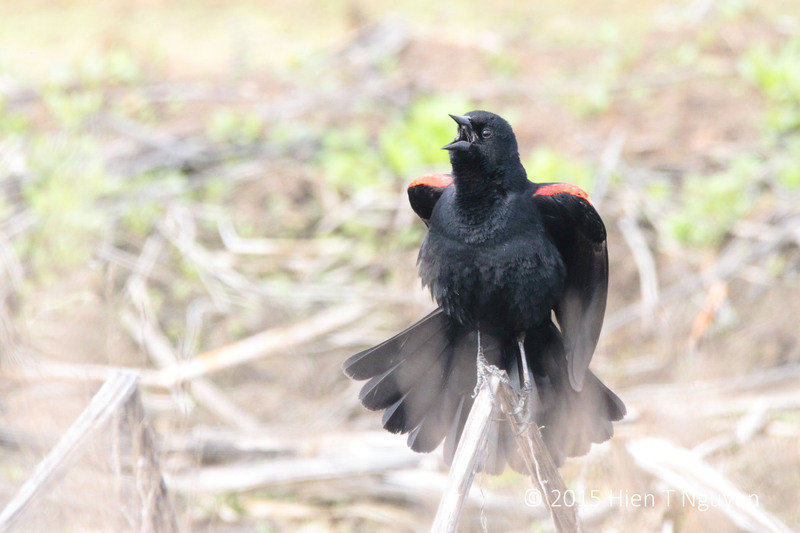 Red-winged Blackbird lifting up for another dive! 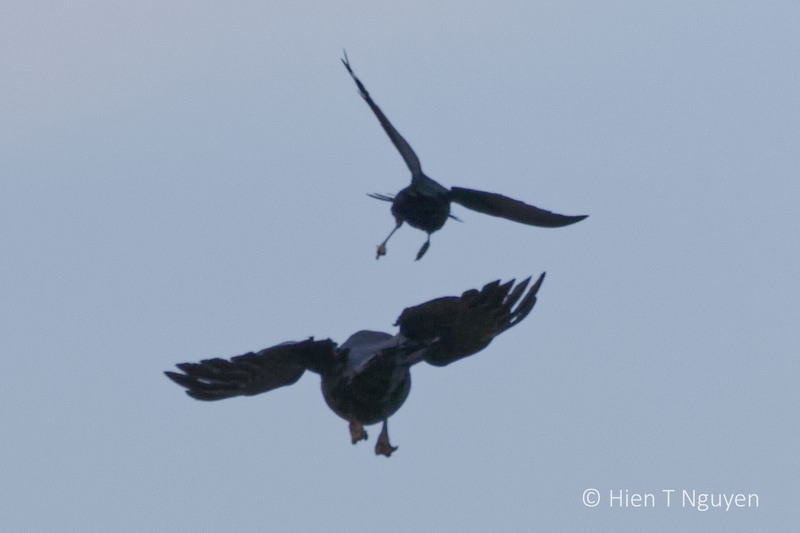 Red-winged Blackbird chasing Black-crowned Night Heron. 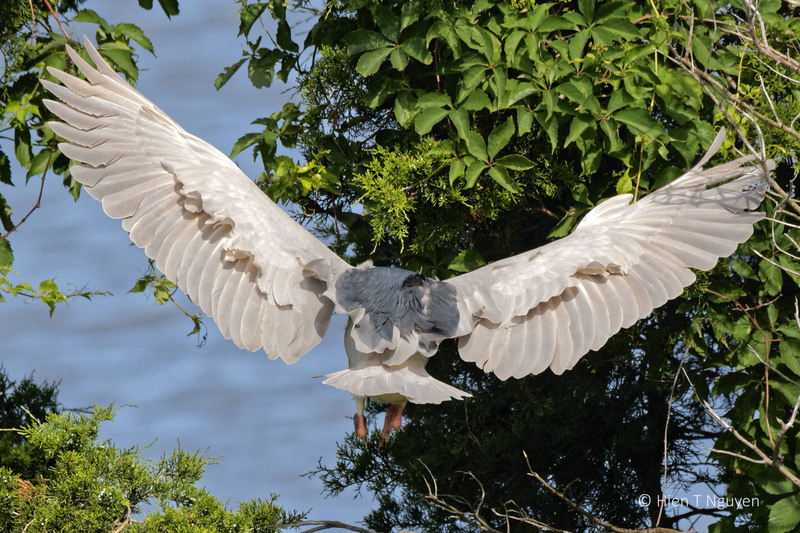 Black-crowned Night Heron landing. 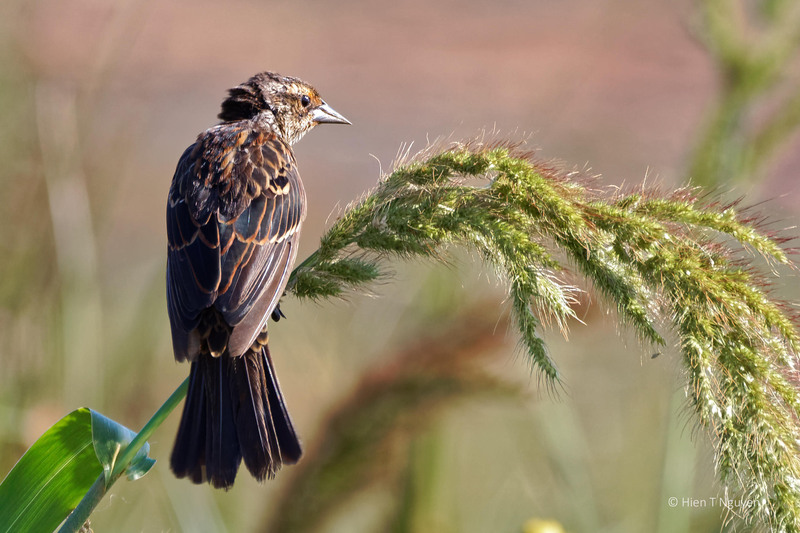 Note gap on its back. 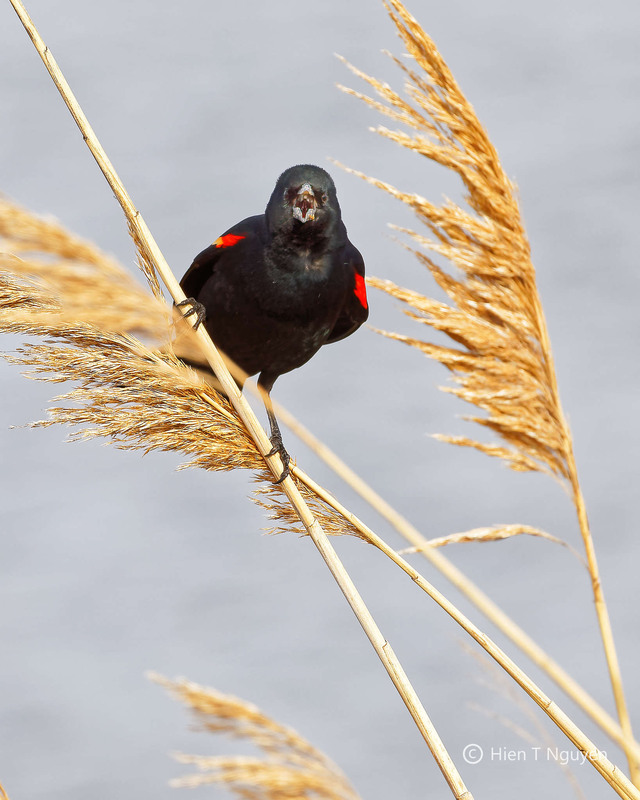 Last September, flocks of red-winged blackbirds were swooping up and down around me at the Abbott Marshlands. 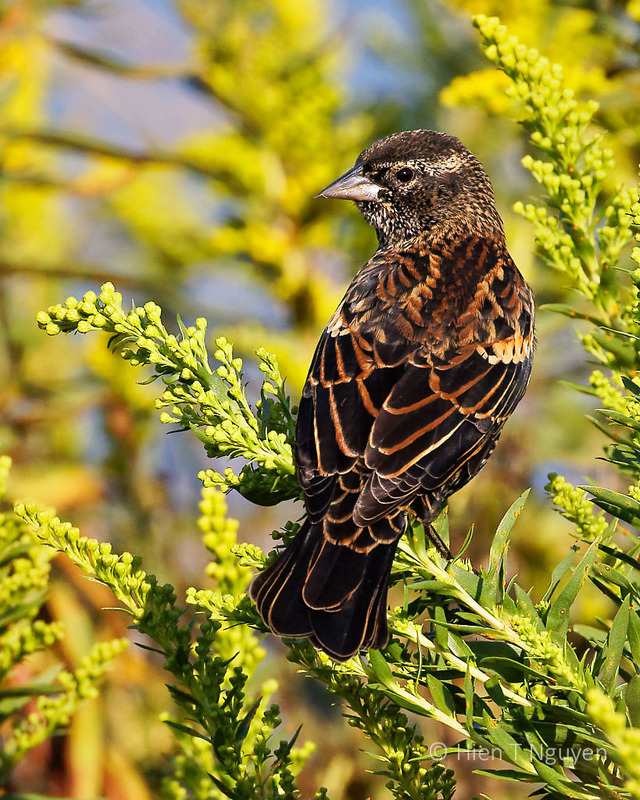 A few landed close by and I took the following shot of a juvenile blackbird. 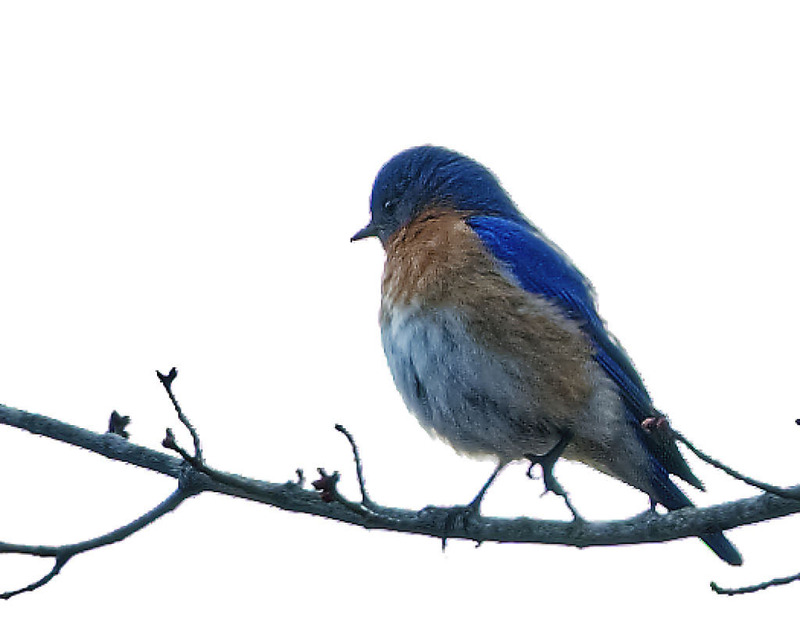 Note the more mature bird with more brilliant coloring beyond it. 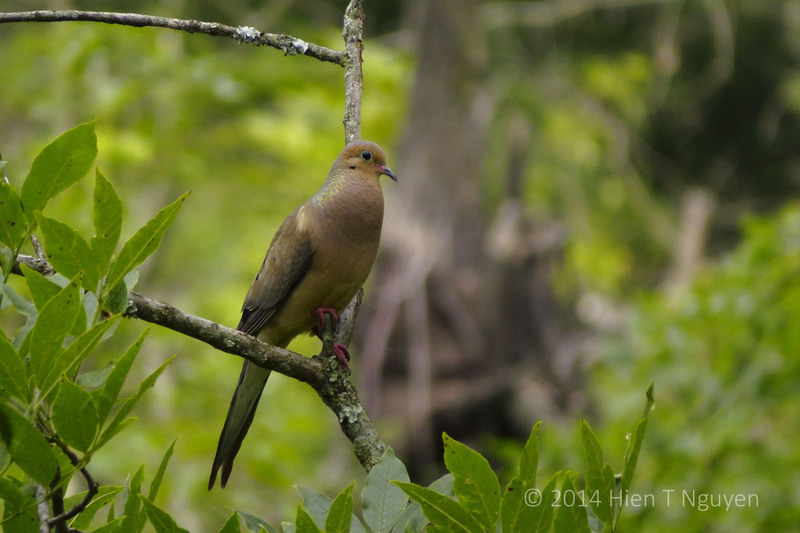 Many mourning doves live in our area, and here are two examples. 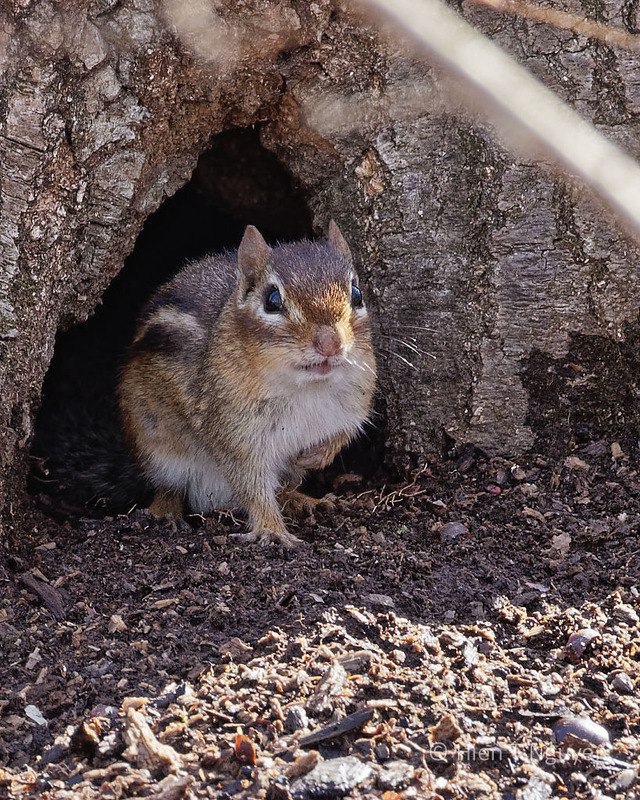 In early October, I was hiking at the John Heinz National Wildlife Refuge when a skunk crossed the road and scurried toward me, coming as close as 30 ft. 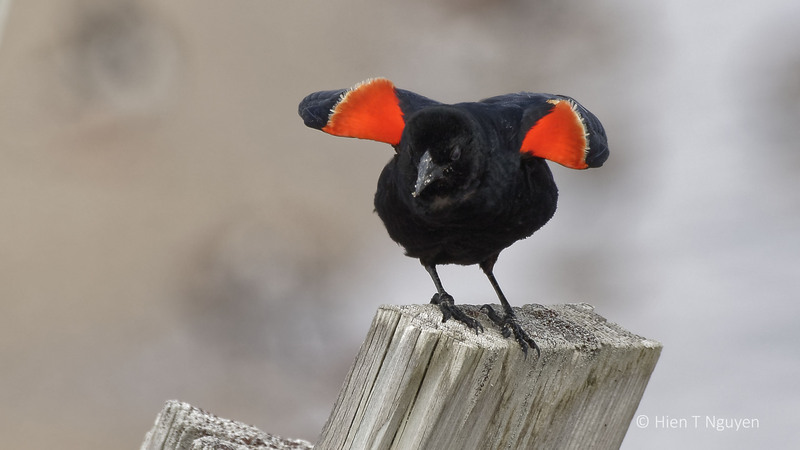 Uh, oh! 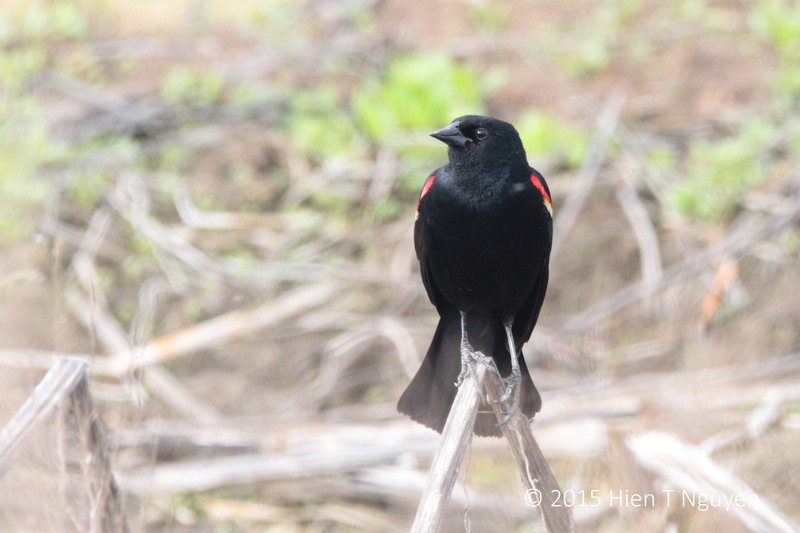 I stopped and squeezed a few shots, including the one below. 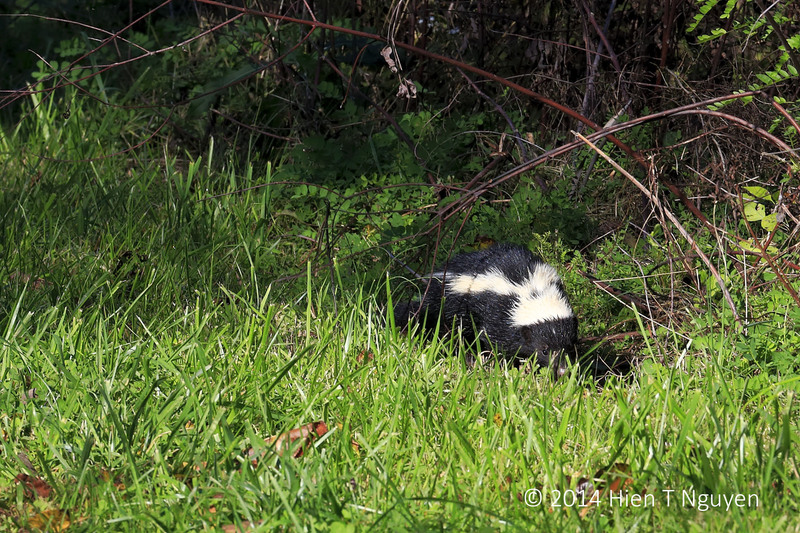 Fortunately, the skunk went back into the bushes and did not spray anything. 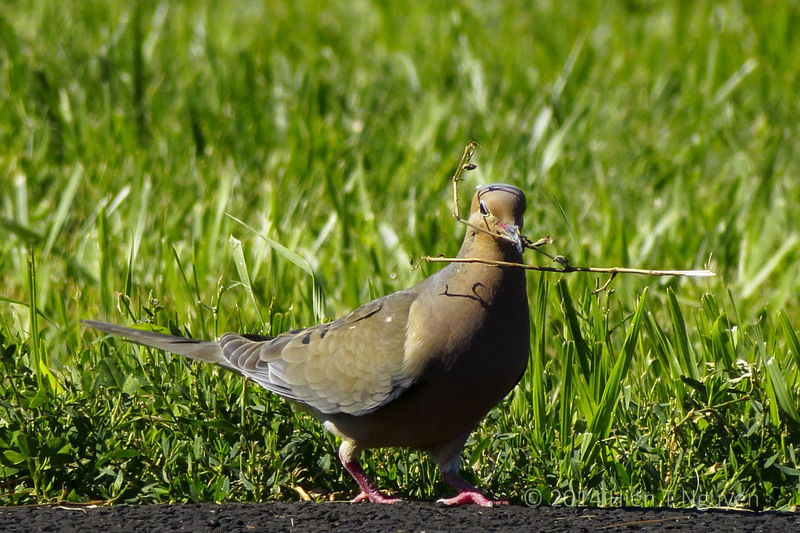 However, it was an omen. The following day, I was told that my job had been eliminated.